The global automotive power electronics market is anticipated to witness a fragmented competitive scenario in the span of coming years. The key players in the automotive power electronics market are investing majorly in the in the developing novel products and implementing advanced technology. Some of the leading players operating in the global market are Texas Instruments, Inc., Infineon Technologies AG, ON Semiconductor Corp., NXP Semiconductors N.V., Maxim Integrated Products Inc., Qualcomm, Inc., Robert Bosch GmbH, Renesas Electyronics Corp., and Mitsubishi Heavy Industries Ltd. 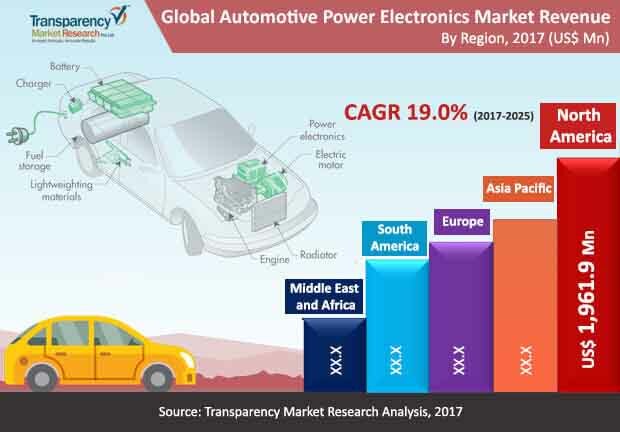 According to a recent report by Transparency Market Research (TMR), the global automotive power electronics market is prognosticated to expand at a steady CAGR of 19.0% within the forecast period from 2017 to 2025. The market is likely to reach around a worth of US$22,658.4 mn by the end of forecast period. In terms of electric vehicle, the global automotive power electronics market is divided into electric vehicles, battery electric vehicles, hybrid and plug-in hybrid electric vehicles. Out of these, the segment of hybrid electric vehicles accounted for the most dominant segment in 2016. This is credited to the importance of decarbonizing the field of transport and in lessening the reliability on the fossil fuels. On the basis of geography, the global automotive power electronics market is led by Asia Pacific region. It is foreseen to project a growth of 20.3%, which is highest amongst all, within the forecast period from 2017 and 2025. The major factor fueling the global automotive power electronics market is the surging demand for advanced technology power solutions for vehicles. Automotive power electronics are gadgets introduced in electric vehicles to control the high extent of voltage and to change varied electric power very proficiently. With the launch of high recurrence and high power changing gadgets, the uses of power electronic converters have increased exponentially. Moreover, rising deployment upgraded convenience system and driver assistance framework and safety have been feeding development of automotive power electronics market. Besides this, the increasing number of electric vehicles is as well a noteworthy factor propelling the development of automotive power electronics market. Electric vehicles are progressively getting to be well known as they are battery-based and don't discharge harmful gases that harm the environment. Therefore, the automotive power electronics market is foreseen to observe significant development in the forthcoming years. For example, in the U.K., the revenue of petrol and diesel vehicles is foreseen to be prohibited by the 2040 as the government authorities are putting efforts improving the air quality in the environment. Because of this, the revenue of electric vehicles is probably going to shoot up significantly in the upcoming decade. On the other hand, increased expense of electric vehicles fueling the sluggish growth is foreseen to test the automotive power electronics market.